Slip dresses are such classics. Surely they were very trendy this past Fall but they will always be a classic staple worth investing in. The key to survive a trend is to invest in an item that is very versatile. A versatile clothing item will always allow you to mix and match and layer creatively, like I did in today’s look. So how do you pick a slip dress that will survive the fads? Read on, below I will provide you with some style tips on picking one that will stay timeless. Pick one in black or grey. Think of it as your little black dress. Pick one made from silk. A good quality silk will have a soft sheen and a fluid fall. You need to go for the luxurious look and a silk slip dress will give you just that. Pick one without many details and embellishments. Most of the embellishments (such as trims, lace, tulle etc) are trend specific and in a few years will make the dress look very dated. So, pick a simple cut and let the dress do the rest. Before I go on with my silk slip dresses picks, I also wanted to introduce you to an exquisite Italian perfume brand: Tiziana Terenzi. 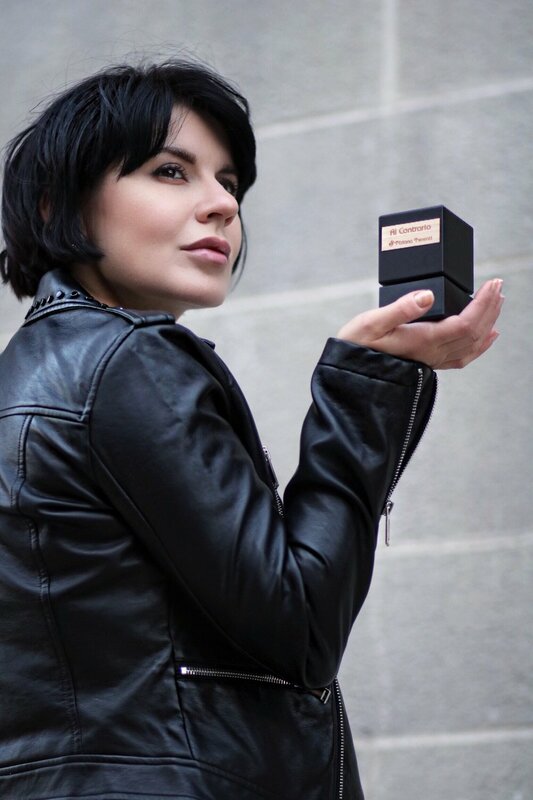 If you are following me on Instagram, you saw my post featuring the perfume and I wanted to elaborate on it because it is an exquisite scent that you may want to consider adding to your fragrant arsenal. It is truly a reinvented classic with a good doze of chicness and coolness. Its scent reminds me of a soft breeze in the warm summer evenings, and dark green forests soaked in rain, and warmed up by the afternoon sun. It has a subtle freshness and dryness reminiscent of warm sandy beaches and it most definitely lives up to its name, Al Contrario, as it is a mélange of contradictions, soft and soothing like whispers. If you liked this post and are interested I more layering style tips, read 4 Easy Tips to Dress Up Your Denim post and How to Layer Leather Jackets for Spring. Thank you so much for stopping by. Comment below to let me know if you own a slip dress and let me know how you style it.